Although it did confuse me for few seconds, I think now that after several rounds of this album in my player, while focusing my eyes on its simple, yet corrosive artwork, I have made a decision. The most insane thing about this album is not the piercing guitar playing that is going berserk on my brain, or the dirty drums that crawl and soothe whatever wound that was opened by the six strings that draw blood from the listeners as well as the guitar player with nothing but ooze and muddy hits over the gaping injury. The most insane thing does not come from any action either guitar player and vocalist Antony Milton or Drummer James Kirk do directly, and with all due respect, but from my own mental action that comes as a result to these sounds. The dazing guitar molesting goes in and out of harsh feedbacks that behave like pulsing marks among the vast, boiling sea of shrapnel and rust that Milton produces. Through this sea of sounds I imagine him on a motorboat, pressing whatever you have to press on a motorboat in order to make it move as fast and recklessly as possible (I have no idea what that might be, never managed a motorboat before. I used to dive though), and making wild wild ripples of dirty sounds that can rip your speakers should you feel adventurous enough with your volume level. Kirk? I think his drum set is at the dirty beach, gathering the mud that falls from the sky and every sharp, naked hit of the wooden stick hits the dirty puddles that gather on top of the drum, sending them forth in every direction. It’s a spectacle to watch, I believe, and it’s a spectacle to listen to, I know. The most insane thing? Yes, well, the music on Aku is blurry and distant, and it calls for the listener to come forth and grasp it. It sounds like a wall is standing between the listeners and the music, and the most insane thing is the will to tear that wall apart bare handed, and to reach into that harmful destruction. 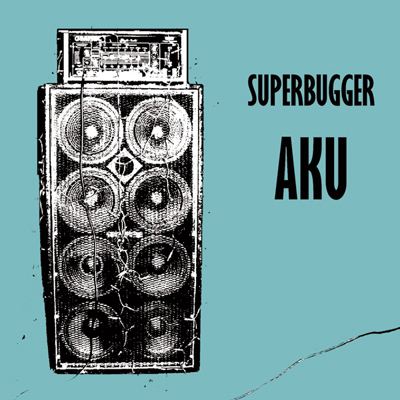 Superbugger is doing anything in its disposal in order to keep you in awe and at bay, you will be in awe, I promise. The dizzying shredded music is indeed something awesome (both full of awe and, what other word you have for ‘awesome’? ‘great’? ), but after the first blinding and deafening shock, all you want is to lift your skinny fists like an army of zombies and go crushing yourselves either into the players themselves or the wall in front of them. This is insane, but it doesn’t mean it’s wrong. If you listen to what I have to say, go get this album, take a leap of faith and dive in concrete steps.